Our Experienced Technicians Can Fix Any Problem! A garage door is a complex system. It is made from a lot of moving mechanical parts, one of which is as an electric motor that allows it to operate automatically. As a result, there is a wide variety of problems that can inflict it. Our team specializes in being able to address them all quickly and efficiently. When one or more of the springs that support the weight of the panels breaks, your door will most likely become completely inoperable. That means that if you try to use it you can actually cause it to collapse. What's more, trying to replace the damaged component by yourself can be just as – if not more – dangerous. Springs need to be carefully installed and adjusted, and that's a job best left to our experts. As we mentioned before, your garage door is able to become automatic thanks to an electro-mechanical device called the opener. This unit uses a drive-system to push and pull a trolley which in turn moves the door. Both its mechanical parts and its electronic components can suffer from a malfunction, and therefore knowing how to detect the cause of the issue, not to mention handle it safely, is incredibly intricate. Our technicians can bring your opener back to its normal function without jeopardizing the integrity of any other component. Some occasions will merit urgency, and our team knows that. That's why we offer local homeowners fast response assistance that will take care of their problem in the shortest timeframe possible. We'll get to you quickly, fix the problem and leave. Just like Batman. 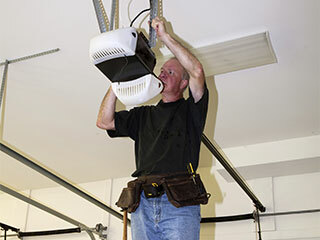 No matter what type of issue you're dealing with, our experts at Garage Door Repair Las Vegas can help. Don't hesitate to reach out to us for any related need you may have. Call us today.